Antique Kaitag Embroideries – The Kaitags are a multi ethnic group living northwest of Derbend in the Daghestan region of the Caucasus. Use silk threads on hand woven cotton and is known for their unique embroideries. Designs are from Ottoman sources and motifs from tombstones. Abstract embroideries made in high color density add to the great variety in Kaitags that incorporate Chinese, Byzantine, Ottoman, Celtic, Mamluk, Timurid designs. These spectacular antique rugs from the Caucasus are an under-recognized and extremely rare art form. They were made primarily by women during the 1600’s and 1700’s. It’s believed that the Soviet Russians put strict controls on the local culture and stamped out this exquisite form of embroidery. Kaitags are traditionally made with luminescent silk floss that is stitched and couched to a plain cotton backing. Colors featured in these elegant embroideries include sophisticated earth tones, vibrant primary colors and chartreuse hues that have prompted comparisons with the vivid, abstract works of art of Paul Klee and Henri Matisse. Until the 1980’s, these beautiful embroideries were virtually unknown. The British traveler and researcher Robert Chenciner is credited with introducing Kaitags to the west, a feat he accomplished following his visit to Daghestan. At the time, scholars estimated that roughly 600 of these traditional antique textiles existed worldwide. Today, they are known by a wider audience although they are still extremely rare. Their graphic designs, abstract details and bold colors give Kaitags a modern appearance that is the product of ancient influences. The symbols and decorative patterns featured in Kaitags include dramatic roundels, spiral-filled mandalas and colorful scenes that depict horseman and charming animals. For the people of the Caucasus, Kaitags were family heirlooms that were made for the most important events. They were crafted for funerals, weddings and births, and they were passed on from generation to generation. Now, collectors can continue the tradition by passing these exquisite silk embroideries on to their descendants. Kaitag Embroideries – Textile designs made up of sinuous, curving forms are usually attributable to the influence of other media – painting, sculpture and metalwork. Weavers of antique rugs and of antique Caucasian rugs tend to design forms that lend themselves to the vertical-horizontal structure and technique of warp and weft, unless they are motivated to copy or adapt a design from another art form. Among textiles, embroideries lend themselves most readily to curvilinear design since the fine-scale needlework technique is independent of the rectilinear structure of weaving. Suzanis and Kashmir shawls with their circles, scallops, and botehs illustrate this quite well. They depend ultimately on the design repertory of Islamic minor arts and architectural ornament. Antique Kaitag embroideries from the Caucasus, however, are a special case in point because they reflect another textile technique independent of weaving, that of felt appliqué. Typical antique Kaitag embroideries like the one shown here have losanges filled by voluted cross forms, or linked chains of small voluted fleur-de-lis. Kaitags are immediately comparable to Uzbek and other Central Asian nomadic felts, whose curvilinear designs are made up by cutting out appliqués and sewing them onto a ground in a different color. While felt is a form of textile, it is carded, mashed, and pressed, and the appliqué process is completed with sewing. So felt production actually stands apart from weaving proper. It is therefore rather interesting that Kaitag embroiderers seem to have been attracted particularly by the designs of felt appliqué. The immediate models they depended on were almost certainly local Dagestan felts from the eastern Caucasus. 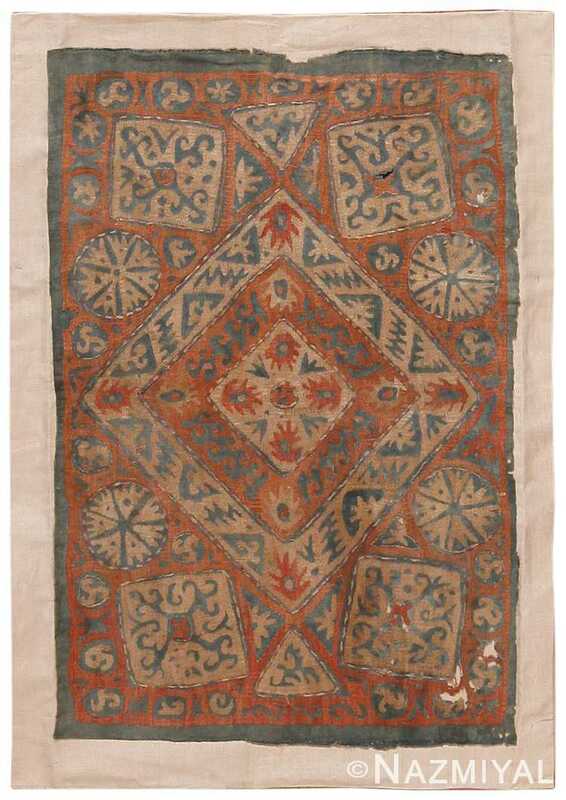 These were closely related to the Central Asian felts and were probably introduced into the Caucasus by felt-producing nomadic tribes from beyond Iran. What is so striking about Kaitag embroideries is their boldness. Despite the use of some fine detail in edges or outlines, they tend to preserve a large scale and a strong graphic contrast that are the antithesis of the fine technique of embroidery. To use so many little stitches to make up such a big design is simply mind-boggling. Antique Kaitag embroideries exemplify so well how far an artist is willing to go in adapting his or her technique to a model or inspiration from another medium. Allegedly eradicated during Soviet rule, Kaitag textiles are a unique style of woven fabric from Dagestan, Russia’s Kaytagsky District, home of Dargins and Kumyks. The Kaitag technique involves laying embroidered silk-floss onto a cotton surface. Many of the compositions are meant to depict hunting and horsemen narratives, and are often reminiscent of the Safavid Persian style. 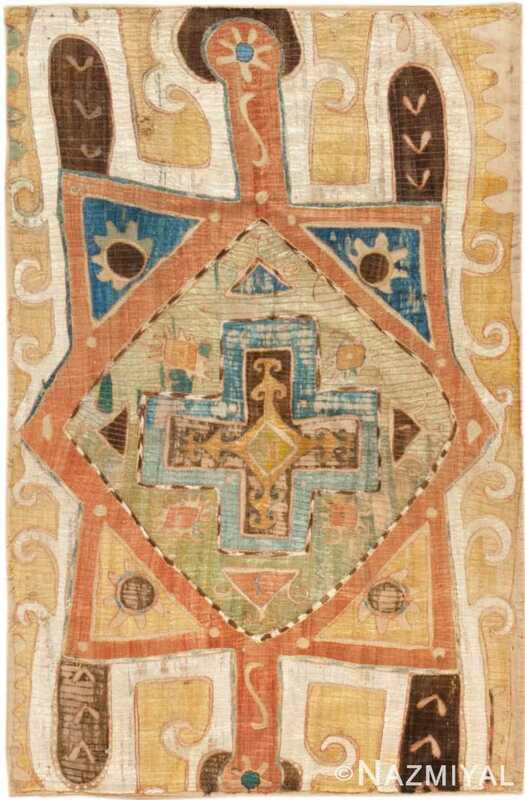 Symbolic figures and abstract glyphs decorate the luminescent flaxen yellow field of this colorful Kaitag woven in the Caucasus during the end of 19th century.